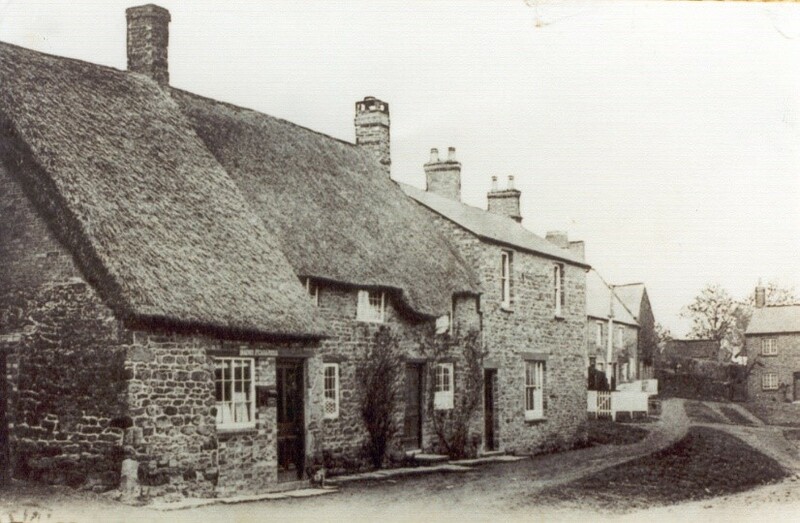 Early days: There was a Post Office in Badby well before 1800. The offices were usually in the homes of the post masters or mistresses so have been in many places around Badby. This photo is of an early Post Office near the bottom of Stoneway. The old Police House is half visible in the distance on the right. In 1901 John Masters was the Post Master and in 1911 Ephraim Cox, the son of the old morris dancer who met Cecil Sharp, was the Post Officer. The son’s grave is in Badby cemetery. 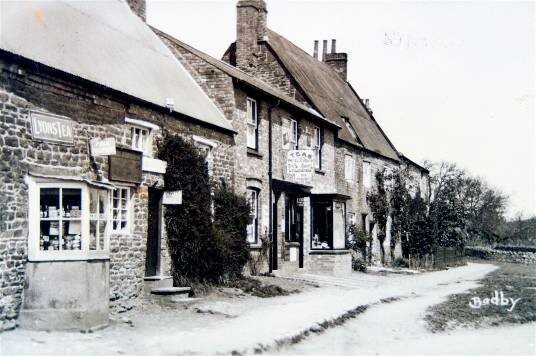 In the 1950s the Office was run by Mrs Dickinson who also sold stationery and at that time it was near the Maltsters pub down a small alleyway. In this picture, the Post Office is near its final position and there was a café next door. You can see at the back of the picture the wall of Bodkin Park – a privately owned piece of walled land which is part of the Green now. 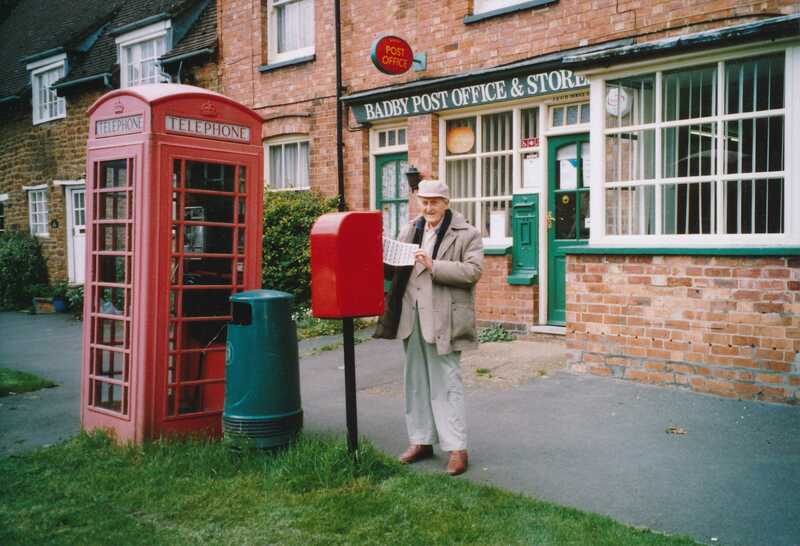 In the 1960s, the Post Office was in its final location where the telephone box is now. David Hodges and his wife Mary ran Badby Post Office together soon after their marriage when Mary was 27. She had the job of balancing the accounts. 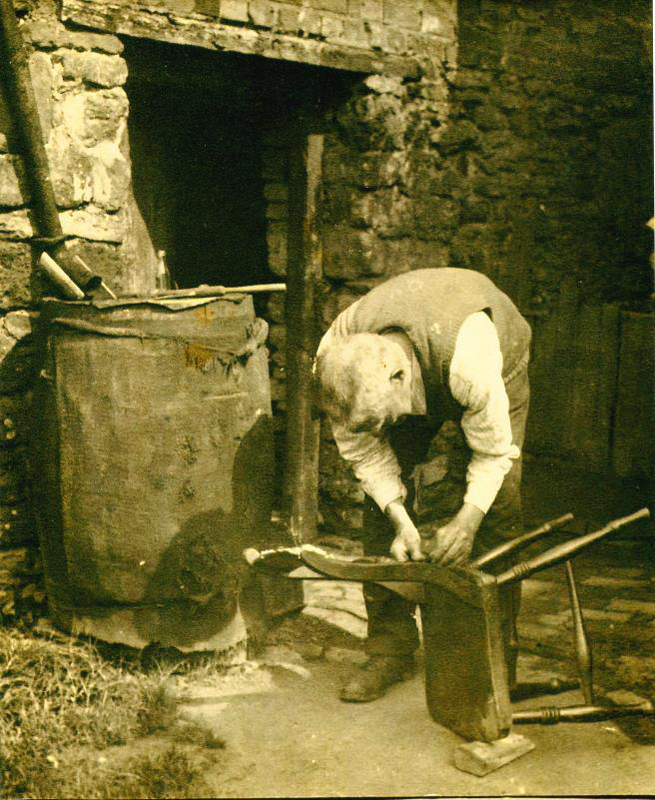 Some people couldn’t pay their shop bills as they went along, so paid at the end of the week or the month. There was one afternoon off a week and no holidays. After their daughter was born it was hard work running the business and looking after the baby at the same time. Another job was to clean the telephone box which was well used as people didn’t have mobile phones or cars in those days and young visitors to the Youth Hostel often needed to ring their parents. David got a licence to deliver milk – about two crates, which he delivered to people round the Green. He was kept busy in icy weather delivering other produce to different parts of the village. 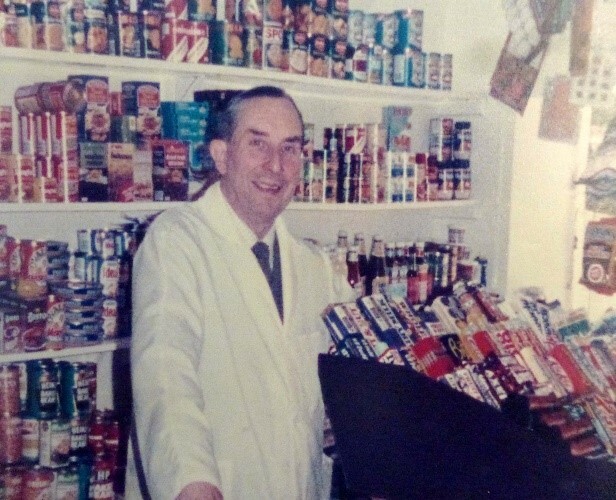 He had got some experience in butchery and sold bacon and vegetables too, getting produce from Banbury Market, going to Cash and Carry to buy other things to sell in the shop. It was an interesting life as Mary got to know all about her customers and the postmen and women became good friends. There was one postie for the village and another went to the farms. Mary and her husband ran the Post Office from 1960 to 1987 and it was always a successful business during their time there. Later the Gallagher sisters owned the Post Office and a Mr Gunstone bought it from them. He made some improvements to the building. The unsorted mail would arrive in a van from Daventry in 2 to 4 large sacks between 7.30 and 8.30 am. The mail had to be sorted into pigeon holes in a small room at the back of the Post Office where only one person could work at a time. The sorting into ‘walk order’ normally took 2 to 3 hours. There were three ‘walking rounds’. The first one was the Village Green and lower end of the village via Pound Lane taking about one and a quarter hours. The second, taking about one and a half hours, was the upper part of the village via Church Green, Bunkers Hill and Main Street. The third was the middle of the village via the Glebe, Park Close, Chapel Lane and Berry Green Farm and took about three quarters of an hour. The trolley was filled up back at the Office between the rounds. When there was nobody in to receive registered mail, it was returned to the Office and a note delivered so that the resident could collect their mail from the Office. When there were mail shots which had to be delivered before a deadline, the load was greater as every home had to be visited. 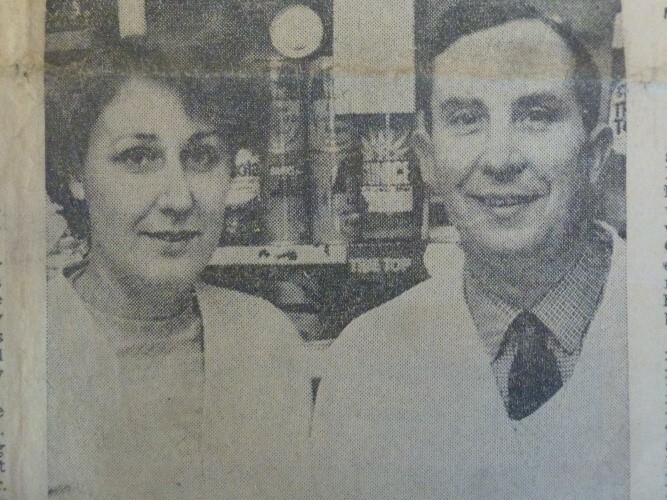 Gill and Jim Douglas from Crick moved into the Post Office in November 1996. They had tried to buy it earlier so were given first refusal by Mr Gunstone. In 1998 Gill was reported to be keen to reopen the tea rooms at the back but sadly, the village Post Office closed on the 20th of March 2008 when Barbara Douglas was the Post Lady. The photo on the right shows Badby Post Office and Store on 30th May 2006. 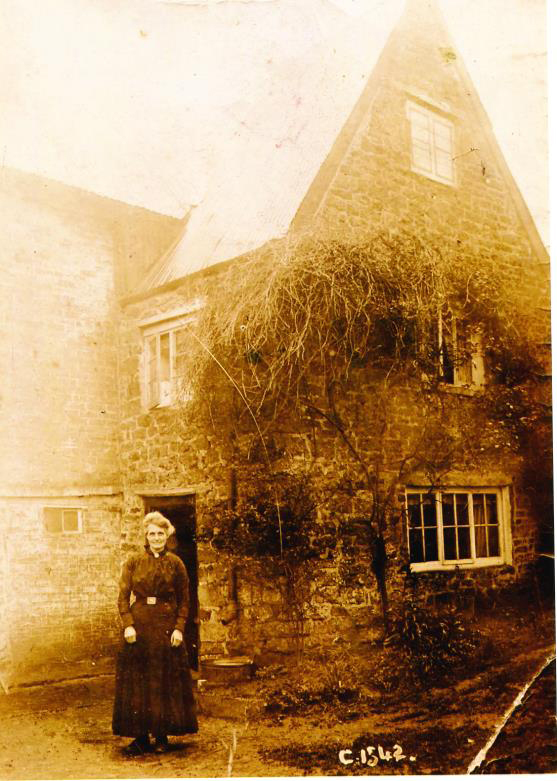 The person posting the letter is Ken Forster (1915-2013), who was then living in Braunston with his son John. Ken started collecting postmarks from all over the world when he began his first job as an office boy at a printing company in Leeds in 1930. 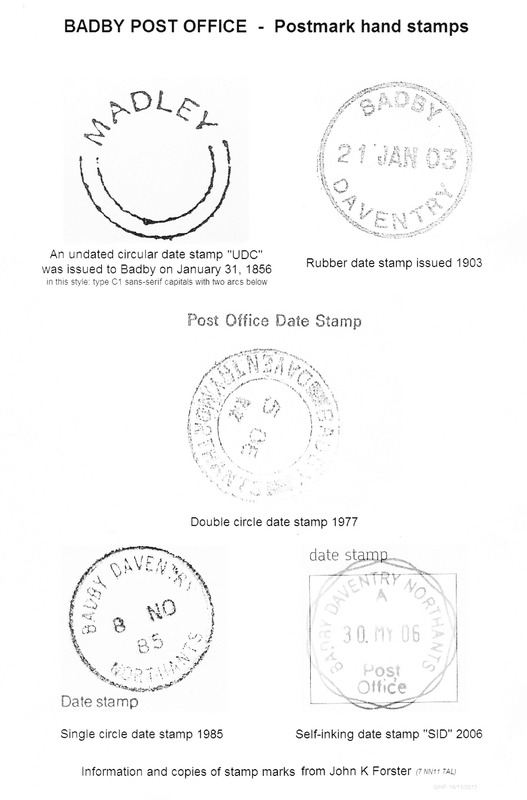 He wrote four books about postmarks and postal history, and his monthly column on the subject in "Stamp Magazine" ran for 36 years until January 2003. John took an interest in postmarks from the age of 14 and is now the custodian of the family collection. Nowadays the mail is distributed from Daventry and Melissa Gibbs is our well -respected post lady. She is the first to be given a Post Office van, as the last postman used to drive in his own car to Daventry to collect the mail. There used to be a separate delivery for parcels but now Melissa delivers them as well as the letters. She uses a portable computer/phone which she says is a great help. She does however carry a few copies of the old paper forms in case the technology fails. 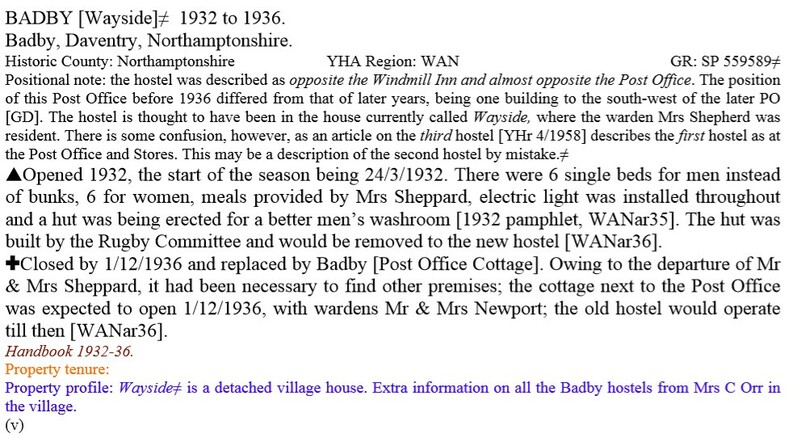 There was a Youth Hostel in Badby from 1932 to 2005. During that time it occupied three different buildings. 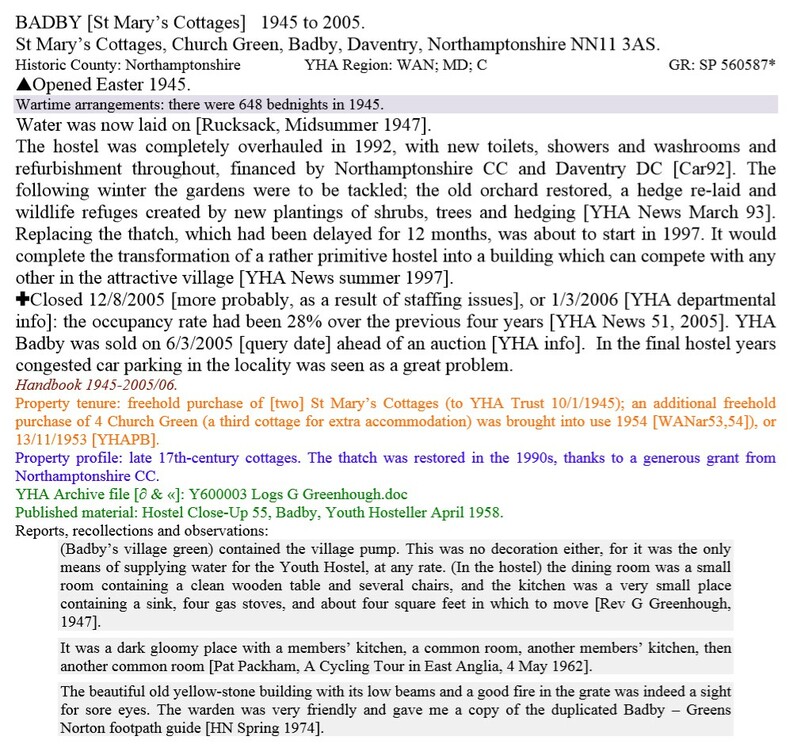 Below are extracts from the YHA handbook, describing the properties. 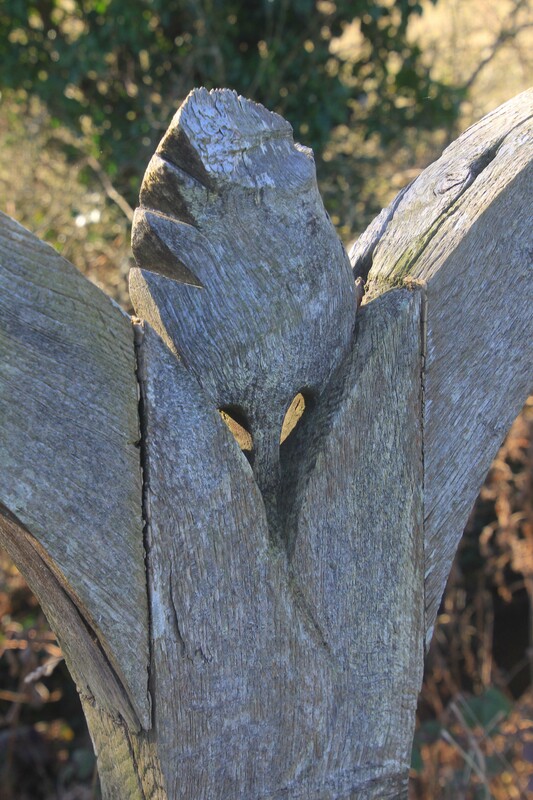 On the boundary between the Badby and Newnham parishes, beside the River Nene, is a wooden sculpture. This sculpture, ‘Source’, was carved from a piece of local fallen walnut by artist Mike Ivens from Long Buckby as part of the Spirit of the Valley millennium project in the year 2000. The 10ft piece of art was made for the Badby Youth Hostel as part of the Northamptonshire Spirit of the Valley project, and is engraved with the letters ‘SOV’ – Spirit of the Valley. When the Youth Hostel became a private house in 2005, the sculpture was moved into its current position on a local farmer’s land by the River Nene next to the Nene Way (OS Grid Ref: SP 56858 59318) between Badby and Newnham. The Head Ranger from Daventry Country Park, Dewy Morris, who lived in Badby, arranged for a group of his staff to move the sculpture to its new position. 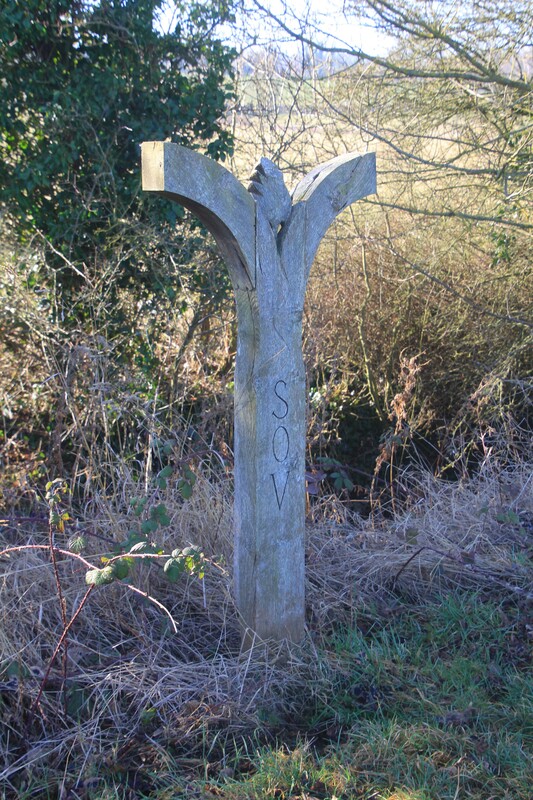 Mike Ivens reports that he also made an oak way marker for Badby at the same time as ‘Source’ to be placed nearby.